That’s why NESCAFÉ wants to encourage you to have breakfast every day. 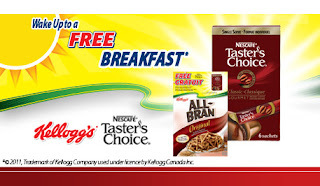 Purchase a specially marked box of SPECIAL K* or ALL-BRAN* and find a coupon printed inside for a FREE carton of NESCAFÉ TASTER’S CHOICE Single Serve Sachets to enjoy as part of a great breakfast. HERE'S A GREAT IDEA! If you got the free box of Special K cereal, and you buy another box to get this offer, you can use the PINs on the two boxes of cereal to get yourself a free limited edition exercise mat! ALWAYS email companies when you have a problem, because you might just get something for your time! But don't forget to ALWAYS send them your positive feedback as well, because they might reward you for taking the time to offer a compliment.